Kummakivi means “strange rock” in Finnish. It is a fitting name for a huge balancing rock in the middle of nowhere in Eastern Finland, more specifically at Ruokolahti. 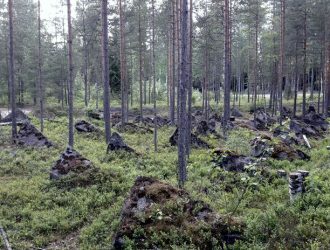 Finland has many remnants of the last Ice Age, most of them are glacial erratics, which are pieces of rock carried by the glaciers for hundreds of kilometres. I was touring Eastern Finland, driving along the wonderful woodland roads and past vast blue lakes. I had heard of Kummakivi before but now was the perfect time to stop there because I had a lovely British friend visiting me from London. She was thrilled to be immersed in all the greenery and landscape so adding a strange rock to her collection of “wonders of Finland” sounded great. All we knew of Kummakivi was that it is mysterious, located in the middle of nowhere, and that not too many people have seen it. So of course we had to go find it. Our navigator luckily recognised the road that takes you to there (it’s Kummakiventie 56, Ruokolahti by the way), so we headed deeper and deeper onto tiny roads. When we got closer to Kummakiventie, we noticed that there are very few road signs that tell you where to go. We first drove to the very end of Kummakiventie and found ourselves by a small lake and a barbeque area. However, no rock in sight. We retraced our steps until the exact address and noticed a small but extremely steep gravel road. Trusting our car, slowly but surely, we drove up the hill and found ourselves at a parking area alongside some clearcut woods. There was no sign where to go but some pondering, we decided that the most well-tread path must be the correct one to Kummakivi. So, more mosquito repellent, a big stick (in case of any wild animals), and a bit of noise so that wild animals know we are there and don’t bump into us (or we to them). We walked along the small path for about five minutes until we got to a fork in the road: one went forward, one to the right. We walked straight and found ourselves by another lake. We looked around and decided we should have taken the road to the right because now we had to hike through thicker forests with no path to take the long way to the rock. So, knee-deep in blueberry shrubs and ducking under spruce branches, we used our navigator to make sure we were going towards the Kummakivi marker. 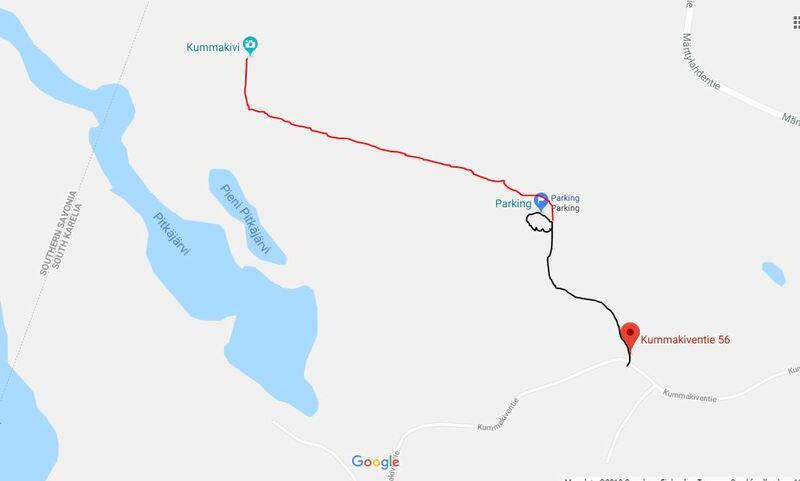 It probably took another 15 minutes more over the hills until we reached a hollow or a canyon between two large hills … and there it was: Kummakivi. Kummakivi is actually a huge rock that balances on top of a tiny boulder. It was protected in 1962, making sure that it is kept safe for future generations to wonder as well. First, it was thought the area would be made into a proper tourist area but thankfully green values prevailed and the area was kept as it now is. The balancing rock is so enormous that it has remained as such for several millennia. But still Kummakivi is truly strange. You can’t help but think if it’s going to fall down if you go sit at its foot. Trust me: it is not. However, as we are very serious about preserving the nature, not destroying our planet, and making sure future generations can also enjoy the wonders of the world, make sure you pick up any rubbish (even if it’s not yours), you don’t try to make the balancing rock fall, and that you leave the area in better shape than how you found it. 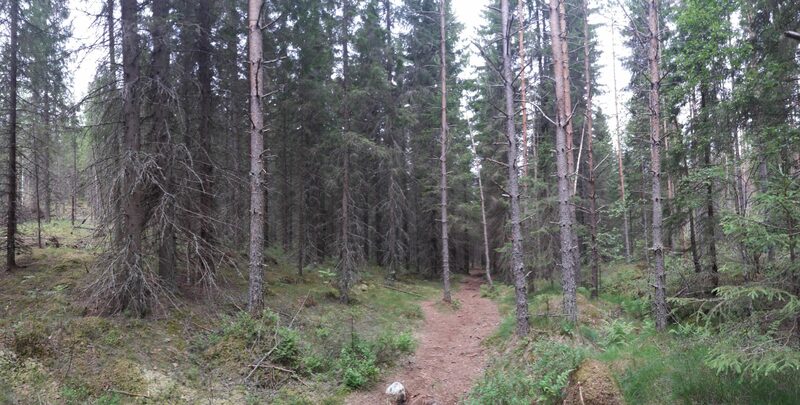 We would have stayed longer, enjoying the quiet forest and taking silly pictures but the especially blood-thirsty Finnish mosquitoes were eating us alive so we decided to head back to the car before we bled out. This time we knew to take the simpler route past the house of a landowner situated just a few metres from the rock. When we got the fork in the road we had passed nearly an hour before, we knew to turn left towards the car. While walking, one family emerged from the forest (obviously lost like we were) and another one along the path, asking us for directions. We were happy to help them, wishing we had some colourful markers to wrap around the trees on the correct path so that it would be easier for people to find the rock. Once you reach this address, you drive up a short but very steep hill to a parking area. There is a path that takes you from the parking area to the rock. It leaves from the bottom of the parking area but it has not sign. It takes about 5-10 minutes by foot depending on your fitness from the parking area to the balancing rock. You follow the path for about 5 minutes, then turn right when there is a Y-fork on the path. Accessibility: The area has some streams which may have water in them. The path is worn but doesn’t support a wheelchair or a buggy for children as it is the natural forest floor with moss, branches, and rocks. 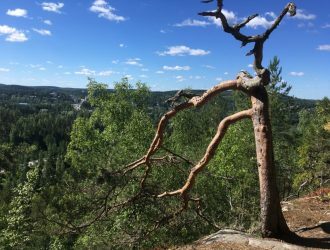 There are some low-hanging tree branches to watch out for, and you will have to walk a little bit up/downhill to reach the balancing rock. 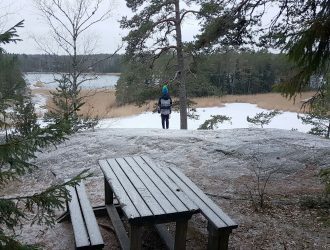 When to go: The best time to visit Kummakivi is when there is no snow. As you have to walk in the forest, it is best that you see where you walk, and this is difficult in thick snow. You will also not be able to see the tiny boulder the balancing rock stands on top of when there is snow. 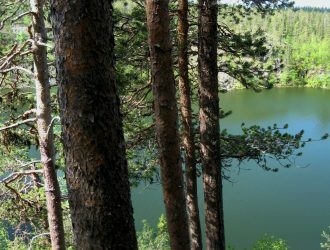 Since you are already in the area, drive all the way to the end of Kummakiventie and visit the lake. It has a bridge made of moss onto a tiny island in the middle of the lake. The moss bridge was built in the 1930s by local workmen in the area.